Gaggia Classic vs. Rancilio Silvia | What's Best for you? » Gaggia Classic vs. Rancilio Silvia, What’s Best for you? The appeal of a semi-automatic machine is the combination of control over the quality of the shot and the convenience of the features the machine regulates for you. The Gaggia Classic and Rancilio Silvia are two examples of the best of Italian espresso engineering. They are both classically designed machines with a great balance of control and automation. The Final Shot: The Gaggia Classic takes the win in this category for it’s lower price point, range of commercial grade features, larger water tank and hot water dispenser. The Rancilio Silvia is still a great alternative, but it just doesn’t come with the same range of features. Both models are slim and compact and have so many features in common it can be tough to distinguish which machine is the better pick to elevate your espresso routine. For this reason we’re taking them head to head to see if there’s one machine that has the edge when it comes to great tasting espresso with a great user experience. Both the Gaggia Classic and Rancilio Silvia are classic looking coffee machines with a chic brushed stainless steel finish. They include well-made portafilters and double-walled filter baskets for making both single and double shots of espresso. The Rancilio Silvia and the Gaggia use a standard 58mm portafilter for their espresso baskets- these are just like the ones you’ll find in your favourite local coffee shop and are great for achieving a smooth, consistent coffee. Both machines also feature standard 15bar pump pressure for optimal extraction, which is pretty common for these types of machines. Neither offer a built in grinder so that is an accessory you’ll need to purchase separately. Both the Gaggia and Rancilio also come equipped with swiveling frothing wands for steaming milk for lattes and cappuccinos. As we noted in the introduction, both these machines are semi-automatic. This means that you can control the flow of water through your espresso handle with the flick of a switch without worrying about setting temperatures for steaming milk or making coffee. You will still be hands on with grinding and tamping and monitoring extraction. These are great machines to hone your barista skills at home, no matter if it’s espressos or lattes on the menu. The Gaggia machine boasts commercial grade construction throughout the unit. The Rancilio does offer quality where it counts with a commercial-grade grouphead, but with commercial quality on almost all its parts, the Gaggia has the slight edge. How essential is a more professional quality machine? If you’re someone who doesn’t use their machine odailyften and only wants to make basic espressos and ristrettos, commercial quality might not be an essential feature. But, if you want to invest in a machine that lasts, and you plan to use your machine more regularly, investing in a commercial grade product will be just that. An investment. The water reservoir on the Gaggia Classic is significantly larger than the Rancilio Silvia. The Gaggia can hold up to 72 ounces of water compared with the Rancilio’s pretty tiny capacity of 12 ounces. This means that with the Gaggia you won’t be constantly refilling your machine if you want to make successive cups of espresso, or use the hot water dispenser that’s included with this model. Although this isn’t too much of an issue if you’re in a one espresso a day household, if there are more that a couple of people using the machine, or you want to make coffees for a group when you’re entertaining, the smaller water capacity is a real problem. Don’t underestimate the convenience of not having to constantly refill! The Gaggia is designed to accommodate more than just espresso or latte drinkers. It also offers a separate hot water dispenser for tea, or for whipping up an Americano. 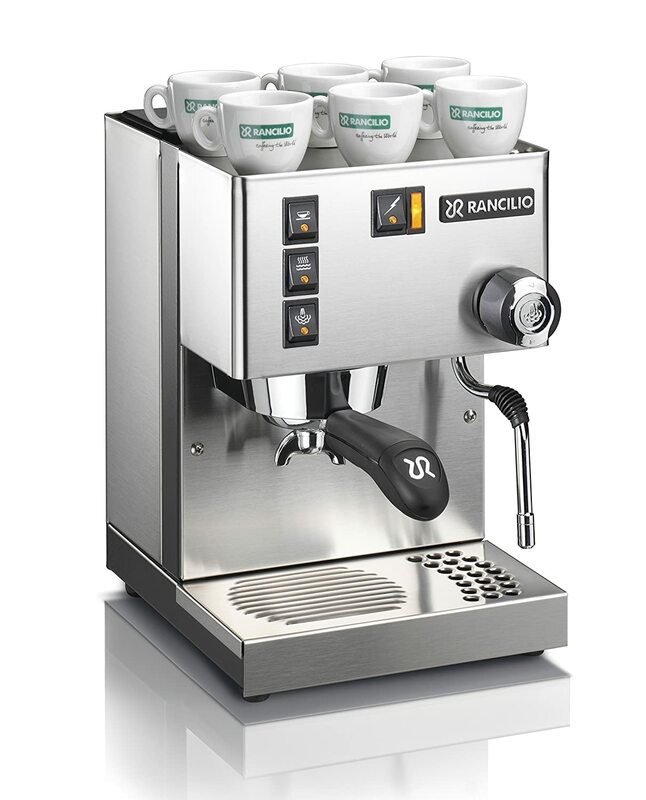 The versatility is a nice bonus and a feature that the Rancilio just doesn’t offer. The Gaggia Classic comes in at ten pounds less than the Rancilio Silvia. This makes the machine more mobile, which is great if you’re someone who needs to store their machine out of sight when they’re not using it. Otherwise, it isn’t a major consideration. This is another commercial feature the Gaggia offers that the Rancilio doesn’t have a response for. The 3 way solenoid valve on the Gaggia Classic allows the pressure between the espresso portafilter and the machine to release immediately after extraction. There are no excess drips of water that fall through onto the coffee in the handle after the water has been flushed through and the espresso made. When you remove the handle, you’re left with a dry puck of used grounds that is easier to knock out of the handle before its next use. Wet pucks are a hassle to remove and generally make a mess of the machine. The Rancilio Silvia has the edge when to comes to footprint. There’s a larger water tank in the Gaggia Classic and this shows in the smaller dimensions of the Rancilio (9.2 x 11.4 x 13.3 compared to 25 x 13 x 12 inches) So, although the Gaggia is the featherweight, it also takes up more space, which means if you have a smaller kitchen space, this is definitely something to take into consideration. In comparison to the Rancilio Silvia, the Gaggia is a steal. Customers love the machine’s durability, and its lower price point means that there’s less of an outlay for a quality espresso. Although most users who opt for a semi-automatic espresso machine generally want to grind their own beans and experiment with different bean roasts, sometimes convenience wins out. In that case, ease of use and a quick fix are a big deal. Pods are a way to expedite the process and get a quick cup when you need it. The Rancilio isn’t compatible with pods right off the shelf. However, you can buy a conversion tool to make the Silvia work with pods should you need the option. The Gaggia on the other hand is compatible both with pods and the regular tamping and grinding of whole coffee beans. Putting your espresso into a warm cup can help the crema last a little bit longer and extend the freshness of the espresso. The top deck of the Gaggia machine acts as a cup warmer to get your espresso cups and mugs ready to receive your espresso shot and keep it warm while you steam milk for a latte or cappuccino. Although both these machines offer some great features that will allow you to experiment like the ‘prosumer’ you are at home, the Gaggia seems to have the edge here. Its lower price point combined with the commercial grade components in the machine make it a great, value-for-money investment that will enhance your brewing experience. With features like the three way solenoid valve for a speedy transition in between cups and the hot water dispenser, you get versatility in the number of different kinds of beverage you can make, and because the reservoir inside is so big, you won’t need to constantly top it up when you need to make coffee for a crowd. The Rancilio does have the benefit of a smaller footprint though, so you’ll need to be sure your kitchen can accommodate the larger Gaggia if you’re going to take the plunge.